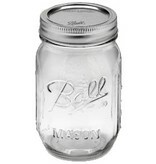 Ball 16oz Widemouth Jars with Bands & Lids. 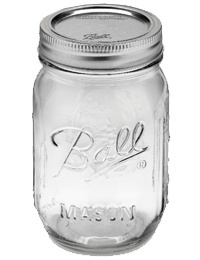 These pint jars are suiteable for hotfill canning, waterbath canning, pressure canning and for freezing! The absence of shoulders in this jar allows for easy filling and easy scooping, dipping of the delicious contents! They also make convenient storage for leftovers and are part of the official Mason Jar Meal starter kit. MADE in the USA.